A semi-final match during the 57th National School Games that was being held at DAV Senior Secondary School in Sector 8 turned violent when 10 players of the Kerala handball team were assaulted by players of the rival Chandigarh team here today. The UT police today made its largest-ever seizure of stolen vehicles by recovering 58 vehicles (mostly Boleros and SUVs) and bikes of different makes from six members of an inter-state gang. The Municipal Corporation here today dismissed its two employees, Suraj Bhan, senior assistant at the Manimajra tax branch, and Sulakshan Goel, a junior engineer, as they have been convicted in bribery cases. MC Commissioner Prerna Puri issued the orders of their dismissal. Five days after the Adviser marked a vigilance inquiry into the siphoning off of fuel from the CITCO-run filling station in Sector 9, a team of officials from the vigilance cell, the weights and measures department and Bharat Petroleum swooped down on the premises this afternoon to check the reported pilferage of over 16,000 litres of fuel, both petrol and diesel. The municipal corporation (MC) may have set an example by installing a garbage-processing plant at Dadu Majra, but the failure of the authorities in a policy on the segregation of garbage has tarnished it. Fully aware of the staff shortage in the municipal corporation (MC), which has been hampering development works, the UT Administration is not sanctioning the 650 posts which have been lying vacant for a long time. Chalking out an innovative mode, the UT Administration has proposed bringing water from the Kajauli waterworks to the Sukhna Lake, particularly during winters, to tide over the water crises. The PGI will soon start deep-brain stimulation (DBS) surgery, which is also known as the pacemaker for the brain, for patients with Parkinson’s disease who do not respond to medicines. The Special Investigation Team (SIT) of Mohali Police, constituted to probe the kidney scam, today served notices on the two hospitals, Surya Kidney Centre, Sector 69, and Silver Oak Hospital, Sector 64, to produce records of the transplants done till date. The Chhatbir Zoo authorities have banned the entry of all petrol and diesel vehicles to the premises of the zoo from January, 2012, and only battery-operated ferries would be allowed. The seven members of the Zila Parishad, who are likely to bring a “no-confidence motion” against Panchkula Zila Parishad Chairman Rajesh Kona, are still underground even as only six days are left for the next meeting of the parishad to be held on January 16. One of the prominent realtors of the region, NK Sharma, who is the SAD candidate from the Dera Bassi assembly segment, has assets worth Rs 6 crore (including the assets of his wife) and surprisingly does not own a single car compared to the veteran politician and former Cabinet minister Jagmohan Singh Kang, the Congress candidate from Kharar, who has assets worth over Rs 17 crore (including the assets of his wife). Congress candidate from Mohali and MLA Balbir Singh Sidhu continued to hold meetings in different sectors of the city. He said the Akalis were misleading the people and actually they had done nothing in favour of Mohali. Although he was in the Opposition, he managed to spend 3.5 crore on the progress of Mohali and welfare of its residents. Efforts made by him are vital and the residents themselves have witnessed it also, he said. To strengthen the case against Ravinder Singh Gill, who was involved in three cases of kidnapping in Chandigarh, Panchkula and Mohali, the local police would soon match his voice with earlier voice recordings which were made during the kidnappings. The Administrator of the local Municipal Council, JC Sabharwal, has urged the safai sewaks of the civic body to clean the area assigned to them in a proper manner so that no complaints are received in connection with the state of sanitation. The municipal corporation (MC) has asked all elected councillors to submit the proposed list of members for ward committees by January 13. In a communication sent by the MC Secretary to all elected councillors, it asked them to list 10 names each from their respective ward which they want to be considered for the ward committee. The cold wave continued today, forcing residents to remain indoors during morning and evening hours. There was no change in day and night temperatures. Having “managed” to maintain their poise till now, parents whose wards could not make to the fourth and last city convent school, St Anne’s, Sector 32, ended up creating a high drama accusing the school authorities of not having putting their chits in the draw. KK Sharma, Adviser to the Administrator, inaugurated the new information technology block at the Postgraduate Government College for Girls, Sector 42 (PGCG-42), that has come with a cost of Rs 3.34 crore. A local court here today issued notice to the district education officer (DEO) and director public instructions (DPI), Chandigarh, on a public interest litigation (PIL) regarding the winter vacations of the city schools and their timings. In what is bound to exaggerate its misery of having lost on the status of potential for excellence and UGC grant of Rs 50 crore, is the fact that Panjab University (PU) scored the least in terms of academic standards, research, examination system, students and staff quality. District and Sessions Judge Naveeta Singh sentenced Ashok Kumar and Angad Kumar to four years in prison each here today. They were charged with firing at Surender Garg. Both the convicts are the residents of Naraingarh. Taking cognisance of a complaint filed by Tanu Bedi on the mismanagement of the Sector-15 old age home, the Punjab and Haryana High Court today put the UT Administration on notice. At various nakas in Mohali, the checking teams seized around Rs 46.53 lakh in cash. 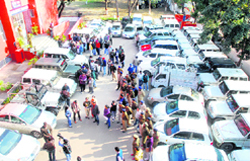 The nakas were set up at different entry points from Chandigarh. The last seizure of Rs 18 lakh was made at a naka in Mohali city. Out of seven Indians figuring in the boys’ singles first-round match, only top seed Rishab Agarwal is keeping the Indian challenge alive on the second day in the India ITF Junior Circuit (Grade) Tennis Tournament at the Sector 10 Tennis Complex here today. Fine batting performance by Sharwan Sharma (35 not out) helped Satluj Stunners to beat Punjabi Tuskers by five wickets in the Satluj under-15 Premier League being held at Satluj Public School, Sector 4, here today. The excellent all-round performance by Talwinder Singh (62 and two for 27) enabled St Stephen’s School, Sector 45, beat LIC Cricket Academy by 45 runs in the 4th Vivek Trophy Cricket Tournament played at Vivek High School grounds, Sector 38, here today. Delhi girls and boys of Haryana pocketed top positions in choi kwang do at the 57th National School Games being held at the Sports Complex, Sector 42, here today. Man of the match performance by Kshitij Sharma (42 runs and three wickets) enabled St Soldier’s Champions, Panchkula, to beat Hisar Challengers by 64 runs in St Soldier’s Champions League played at St Soldier’s School here today.